FDI+ designs and supplies wash solutions for trains, metros, light rail transit (LRT) and locomotives with the best balance between quality, service and price based on customer care. The company’s flexibility, creativity and innovation values push it ahead to anticipate specific needs in rolling stock evolutions. Starting from early design stage of project up to final test and commissioning on site, FDI+’s team is fully dedicated to meet the needs of its clients. FDI+’s modular equipment includes both stationary or drive-through washing stations, including Stop & Go mode. 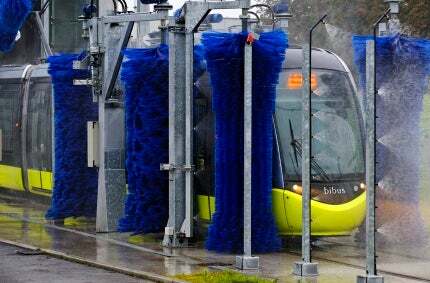 Part of the heavy wash products range, the company supplies robust and reliable equipment shared between washing track, technical premises and underfloor parts of train wash solution. FDI+ also delivers complete solutions, including traffic indicators, train identification systems, motion-sensors, train driver information displays and oil separators. Additionally, the technical room supports all components that run the machinery, including intuitive touchscreen control for a user-friendly interface with the maintenance team. FDI+’s equipment includes water treatment systems for washing water recovery and reuse, such as physical filtering systems, biological treatments and hydro blocs for surfactant products removal. As the quality of the train wash depends on water quality, and to avoid any spots on vehicles while drying, the company offers a complete range of machinery for rinsing water preparation, including softener systems, declorination filters, demineraliser systems using reverse osmosis principle, and wash concentrates. ISTOBAL’s ESENS brand develops chemical products for maximising performance and achieving the highest number of washes with minimum consumption. Featuring new revolutionary improvements and based on the ‘cost-per-wash’ concept, ESENS optimises operations and reduces costs without affecting the wash quality. The group’s xtract range of concentrated products allows basic reconstruction of product, staring from 700ml biodegradable capsules. A member of the ISTOBAL Group since January 2013, FDI+ takes profits of ISTOBAL’s leadership in washing solutions across more than 60 countries. ISTOBAL Group includes eight subsidiaries and 60 distributors for a worldwide presence. French, Spanish, Brazilian and US subsidiaries have their own manufacturing facilities to fit exactly with local requirements.